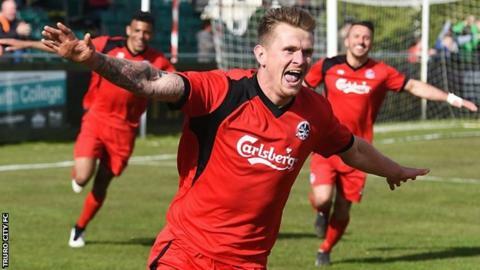 Truro City secured a home promotion play-off tie in the Southern Premier League after beating leaders Corby Town 2-1 at Treyew Road. The victory, which was sealed thanks to Shane White's late penalty, ensures Steve Tully's side can finish no lower than third in the division. City went behind after an early mistake by goalkeeper Tom McHale, but Craig Duff equalised soon after half-time. "The way the lads played was a credit to them," Tully told BBC Cornwall. "I never felt like we were going to lose the game, even at half-time when we were 1-0 down, I always felt we'd get chances and we've got that sprit in the squad - they never give up," he added. Truro could still win the league if they win their remaining two fixtures and Corby fail to get a win, while second-placed Poole Town have four games to go and are only one point above City. "We want to finish as high as we can, if we win the next two anything can happen," Tully said. "There's a lot of football to be played, Corby have got to play all their games away from home, Poole have got a tough run in. "We can only finish on 89 points and we'll try and see where that takes us. "This is a club going places and we'll make sure we keep striving to keep the club going forward."